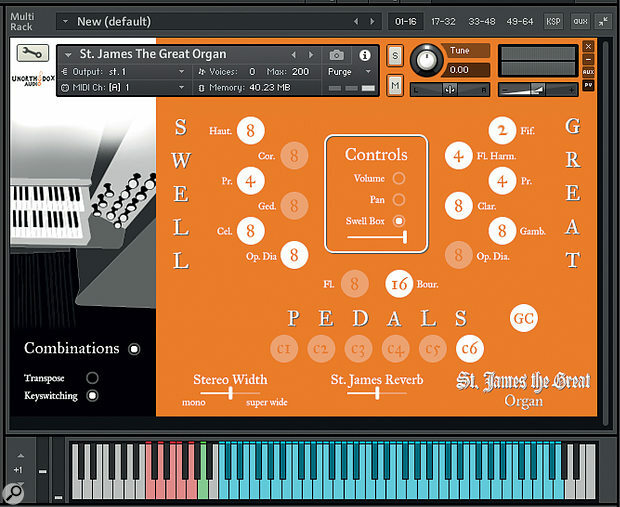 Unorthodox Audio are a newcomer to the arena of Kontakt instruments, currently offering two products at opposite ends of the sonic spectrum: Superfly Drums and St James The Great Organ, which, as the name implies, has been built from samples of the pipe organ installed in the church of St James The Great in Snitterfield, Warwickshire. This is a 19th‑Century English church organ with dual four-and-a-half octave (C‑G) manuals, a two-and-a-half octave pedalboard, and just 16 stops (of which 14 are recreated here), so don't expect the grandiose power of a large cathedral organ. The 14 stops comprise two reeds, five principals, five flutes, and two strings, the longest of which is the 16' Bourdon rank assigned to the bass pedals, and the shortest of which is the single 2' rank. The Celeste (an 8' string) is tuned slightly flat so that it choruses gently when combined with other stops. You can transpose the playback within the instrument itself by ±12 semitones but, to stop munchkinisation, this selects the appropriate samples rather than pitch-shifting those under each key. Alternatively, you can use the transposer within Kontakt to pitch-shift the samples. While this can change the characters of sounds for additional flexibility, it generates noise, so I wouldn't in general advise it. Unorthodox Audio have included several facilities in the Kontakt instrument that are not present on the original organ. For example, there are individual volume and pan controls for each of the stops, and you can assign MIDI CCs to each of these to automate the registration. There's also a control for a virtual swell box. On pipe organs, the swell box reduces the amount and pressure of air reaching the pipes played from the Swell manual, causing them to speak more slowly and at a lower volume. Here, the swell box reduces the volume but doesn't appear to affect the attacks of the notes. Next we come to the Stereo Width control, which uses the standard Kontakt stereo width algorithm. At its maximum, this spreads the organ across the whole panorama, which is a pleasing sound. In addition, Unorthodox Audio modelled the reverberation within the church and added this to the instrument. You can apply this using the Reverb slider or, of course, utilise an external effect of your choosing if you fancy something with greater intensity and a longer decay. Aside from the lack of 32' stops and the massed ranks that would fill the Royal Albert Hall with musical grandiosity, the most obvious limitation of the St James The Great organ is the fact that it only has octave stops. This means that there are no fifths or other harmonically interesting intervals available, and therefore no Mixtures to create complex sounds. Nonetheless, its voicing can still range from gentle to strident, and it comes with nine example presets that demonstrate this well — but always within the limitations of being a small church organ. If you choose to load a single instance of the Kontakt instrument and play it from a single keyboard, you'll find that the Swell and Great manuals and, over its more limited range, the pedalboard are permanently coupled, which greatly limits the range of sounds you can obtain and how you can perform with them. It's therefore worth spending some time setting it up correctly, loading three instances within Kontakt, assigning each an independent MIDI channel, and then playing the manuals and pedalboard separately as nature and JS Bach intended. If you do so, you'll find it a much more convincing and characterful instrument than if you layer everything over everything else. I only encountered one problem during my tests. On very rare occasions that I couldn't recreate but may have been linked to my experiments with pitch‑shifting, I was able to disable the loops of some of the samples so that some of the notes under some of the stops played for just a few seconds and then stopped. Closing and reloading the instrument always fixed this, but it will be good when the bug is identified and eradicated. Small church organs are not mainstream instruments in modern music, but they are nonetheless interesting, and they are able to add another flavour to suitable compositions. The St James The Great Organ is a nice example of the genus. There are six excellent examples of its use on the company's website and, if you've heard these, there's nothing that I need to add. If you haven't, listen to them and, if you like what you hear, it could be worth the small investment. Finally, it's worth noting that one of the founders of Unorthodox Audio learned to play the organ on the original St James The Great organ, and the company will be donating some of the proceeds from the sales of the Kontakt instrument to keeping it serviced and in good condition. That's another damn good reason to buy it.